It’s no secret that Christmas through New Years is the busiest time to travel. Unless you make plans months in advance, your travel options are pretty limited if you hold off booking until the last minute–especially if you don’t want to pay an arm and a leg. Since my schedule changes daily and I wasn’t able to book a big trip in advance, this year I kept it low key and went on a road trip with my sister and best friend. I had always wanted to visit the White Sand Desert, so we decided to hit the road and drive to New Mexico from Los Angeles. Our first stop: Albuquerque, New Mexico. Albuquerque: We drove thirteen hours straight to Albuquerque (yes, it felt as long as it sounds) and spent the night there. We left LA around 7am and arrived in Albuquerque around 8pm. I always do my research on what to do and where to eat when I visit a new place, so we had a game plan for dinner. We were exhausted from the drive so wanted something casual and comforting and decided to try Frontier Restaurant. I’m all about hole in the wall spots and this place was right up my alley. It has a vintage Western theme and serves authentic Mexican food—and the best part: it’s open late. The menu is extensive and reasonably priced- you can get a burrito for as little as three dollars. New Mexico is known for their green chile, so I ordered the Frontier Burrito with green chile sauce. It had beef, beans, and green chile inside, and green chili stew and cheese on top. It was delicious. Also, be sure to try one of their warm freshly baked cinnamon rolls for dessert. Killer. Next stop: Taos, New Mexico. Taos: The drive from Albuquerque to Taos was two and a half hours and we were surrounded by snow-covered mountains. I’m a Cali girl, born and raised, so seeing snow is exciting. The drive through the snowy mountains to Taos was really beautiful. 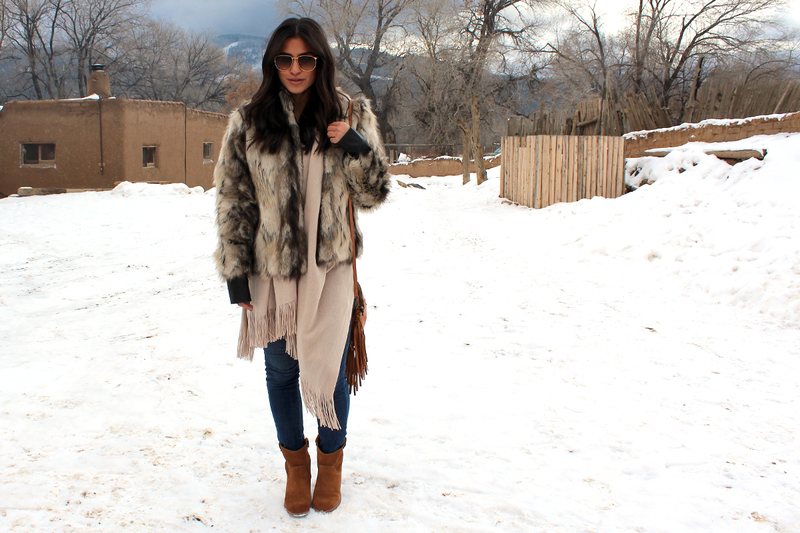 Taos is a small town surrounded by the Sangre De Cristo Mountains in Northern New Mexico. It’s known for its historic adobe buildings, most notably the Taos Pueblo, an adobe complex that was inhabited by Native Americans for centuries. We spent a half day visiting the Taos Pueblo ($16 cover charge), and walking through the town plaza and shopping at the authentic Navajo art galleries and boutiques. We were in love with all of the amazing southwestern decor and turquoise jewelry. Next stop: Santa Fe, New Mexico. Where to stay: We spent two nights at La Fonda on the Plaza which was conveniently located in the main square, right in the heart of Santa Fe. La Fonda has a lot of interesting history. City records show that the hotel sits on the site of the town’s first inn when the spaniards discovered the city in 1607, making the property the oldest hotel site in America. La Fonda’s history can be traced back 400 years. Throughout the 19th century the hotel was a popular lodging open among soldiers, gold seekers, gamblers and politicians. It still remains a Santa Fe landmark today. The hotel was so lively and festive–it was beautifully decorated for the holidays and the lobby was buzzing with guests lounging by the fireplaces and dining in the lobby cafe and restaurant. We spent New Years Eve sipping hot chocolate by a fireplace and venturing out to the main plaza right when the clock struck midnight. I highly recommend dining at La Plazuela, the restaurant located off the main lobby. With a garden-like courtyard featuring twinkle light trees, it’s a beautiful setting to enjoy any meal of the day. La Fonda is a great place to stay and perfectly located in the heart of Santa Fe. Tomasitas: I always ask for suggestions on social media on where to eat in every city I visit. For Santa Fe, a ton of people suggested Tomasitas. We went for lunch and ordered just about everything–from the sopapillas, chalupas, and flautas to the enchiladas and tacos. My favorite was the freshly baked sopapillas with the honey butter and maple syrup. Rosewood Inn at the Anasazi: We went to dinner at the Rosewood Inn at the Anasazi. This charming boutique hotel was also centrally located off the main plaza. It had a cozy library and living rooms off the main lobby where family and friends gathered around fireplaces with cocktails and wine. Off the main lobby is the Anasazi Bar & Lounge which is a great place to have a few drinks and delicious appetizers. The Cubanitos, Pork Belly sliders is an absolute must order. They melt in your mouth and the flavor was impeccable. If you are visiting Santa Fe, The Rosewood Inn at The Anasazi is worth a stop. Last stop: White Sand Desert National Monument, New Mexico. White Sand Desert: We decided to take a four-hour detour from Santa Fe to the White Sand Desert on our drive back to Los Angeles. I had seen breathtaking photos of the white sand dunes on the internet and couldn’t leave New Mexico without checking them out. It is a national monument so there is a $5 a person entrance fee. There is a long road and you can park in different areas throughout the park to explore the dunes. There are also a few hiking trails that are fun if you have the time. It was like nothing i’ve ever seen, it almost felt like you were on a white sand beach rather than the middle of the desert. We couldn’t stay long since we had a 12 –hour drive back to Los Angeles ahead of us, but it really was worth the stop. TRAVEL TIP: The altitude level in New Mexico is fairly high, so if you’re prone to sickness (like my poor sister), you might want to make a stop at the drug store before you hit the road! Pics look fantastic =) Definitely have to take a trip out there – it would be a nice change from the somewhat typical resort like venture.